I didn't get this Bead Journal Project piece finished for October, but now at last it's done for November! 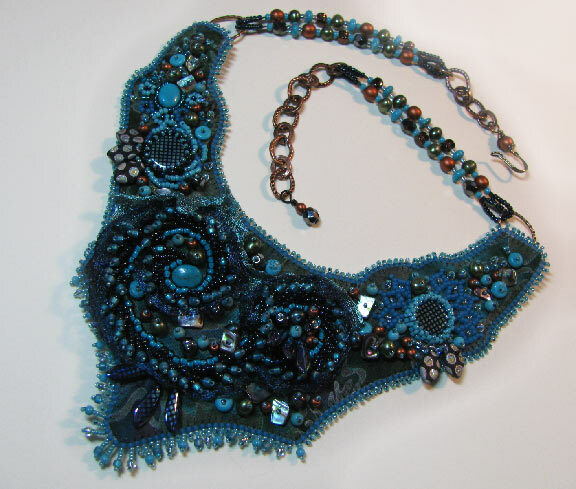 I used metal mesh ribbon from Fire Mountain Gems, Czech glass beads from The Best Beads, and the embroidered forms of St Petersburg chain stitch, African helix, chevron stitch, and Russian spiral from Bored By Back Stitch. Soon, very soon, I will have a tutorial to post! This piece is stunning, Cyndi!!!! Just beautiful!!!! I forgot to post the name! Thanks to Paul Bishop, it's now called Midnight Sky of Distant Stars :-) Thank you, Robbie!